Composed by J.B. Dykes (1823-1876). Arranged by Todd Marchand. Christian, Sacred, Patriotic. Score, Set of Parts. 12 pages. Published by Con Spirito Music (S0.350485). 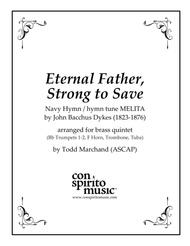 "Eternal Father, Strong to Save" is a hymn traditionally associated with seafarers, particularly in the maritime armed services. Written in 1860, it was published in the first edition of the influential hymnal, Hymns Ancient and Modern, in 1861. Its author William Whiting was inspired by the dangers of the sea described in Psalm 107. Popularized by the Royal Navy and the United States Navy in the late 19th century, variations of the hymn were soon adopted by branches of the armed services in the United Kingdom and the United States, including the Royal Marines, Royal Air Force, the British Army, the United States Coast Guard and the United States Marine Corps, as well as many navies of the British Commonwealth. Accordingly, it is known by many names, variously referred to as the Hymn of Her Majesty's Armed Forces, the Royal Navy Hymn, the United States Navy Hymn (or just The Navy Hymn), and sometimes by the last line of its first verse, "For Those in Peril on the Sea". 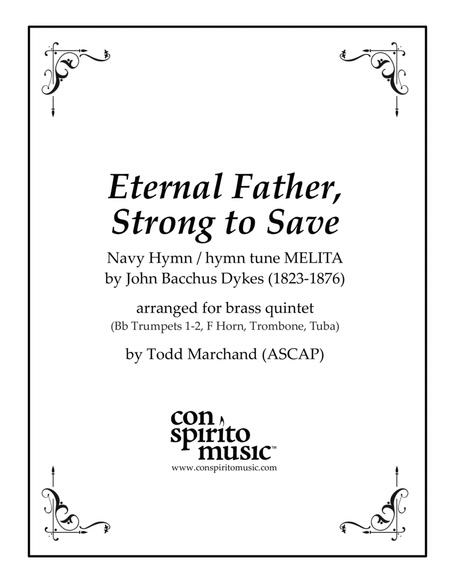 The hymn has a long tradition in civilian maritime contexts as well, being regularly invoked by ship's chaplains and sung during services on ocean crossings. John Bacchus Dykes, an Anglican clergyman, composed the tune "Melita" to accompany the Hymns Ancient and Modern version of the text 1861. Dykes was a well-known composer of nearly three hundred hymn tunes, many of which are still in use today. "Melita" is an archaic term for Malta, an ancient seafaring nation which was then a colony of the British Empire, and as the site of a shipwreck, mentioned in Acts of the Apostles (chapters 27–28), involving the Apostle Paul.